When it comes to the choice of film cameras to kick start your interest in film photography, or to go back into (if you are a digital photo enthusiast), I am one of the guys who will say that vintage manual focus cameras of the '70s may not actually be the best choice for you. What I am recommending is an AF (autofocus) 35mm SLR film camera from the '90s, or specifically, an AF SLR camera that was introduced about the time digital SLRs began to take root. The simple reason for this recommendation is that these cameras are very advanced with their AF technology and comes with full PASM shooting modes, advanced metering systems, and features close to what you already have on your current digital SLRs or ILCs. 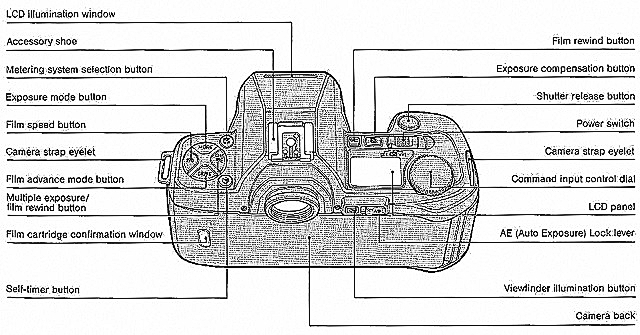 With these cameras, you will still be able to learn all the things you need to know about film cameras, say, learning about the exposure triangle or exposure compensation, and to top it all, you will always end up with images that are perfectly exposed with tack sharp focus for each and every frame. The camera lines you will want to look up in this domain are the Minolta Maxxum (Dynax in Europe) series, which have the same A-mount lenses as Sony Alpha cameras, Nikon's F-series (N-series in the US) whose lenses are compatible across the board with Nikon F-mount digital SLRs, and Canon entry-level EOS SLRs. One specific recommendation for a camera make and model that suits this genre well is from Nikon, namely the Nikon F-801s. 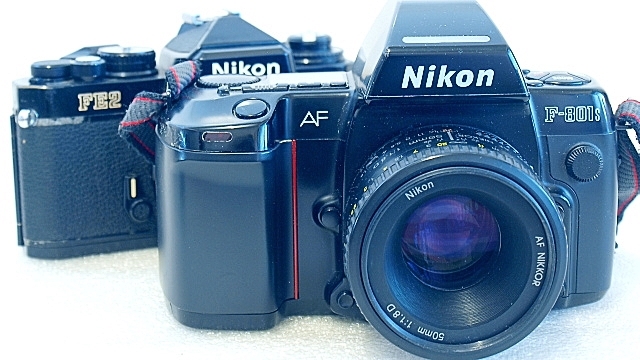 The F-801 series cameras, despite being designated as an amateur model by Nikon's 3-digit nomenclature, is actually an advanced semi-professional model. 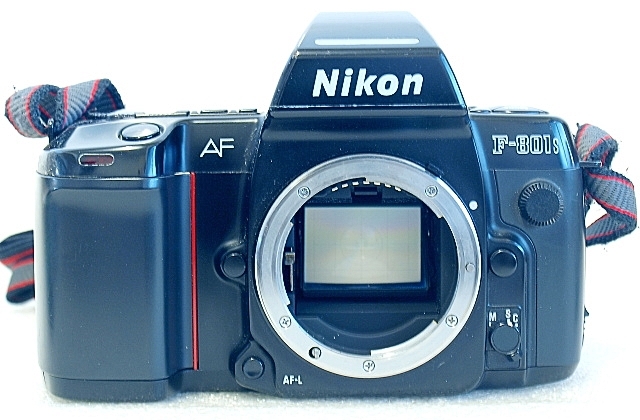 When released in 1988, Nikon ranked it just below that of the F90 / F90s (N90 / N90s) series. The update, the F-801s, comes with an added spot metering feature. 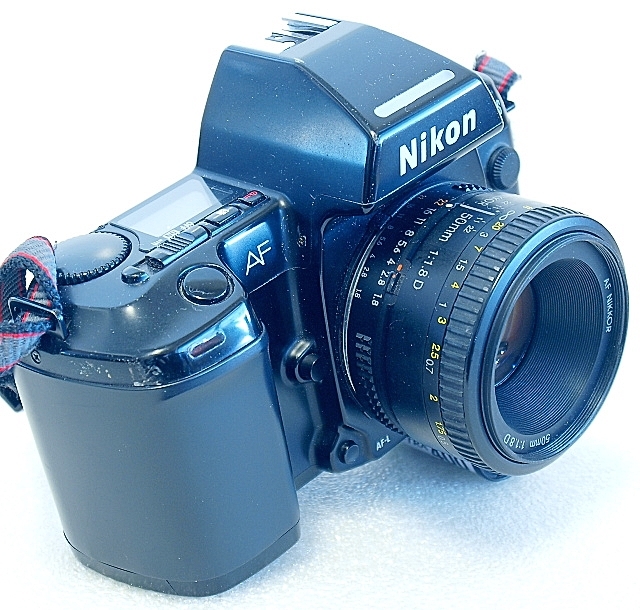 The camera was also the technology forward to the semi-professional manual-focus Nikon FE2, whose lineage was replaced by the AF system camera Nikon was introducing in the '80s. The FE2, as we know it, is by itself a camera of high esteem and advanced features, which came with its own accolades and bragging rights. 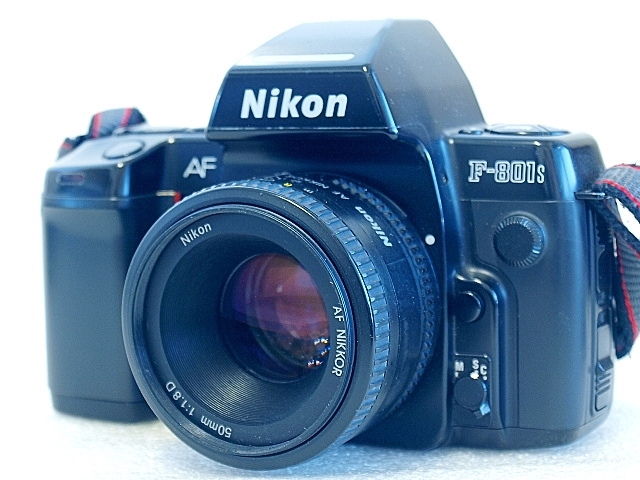 During the early 1990s, the F-801s was Nikon's top-selling non-professional AF SLR cameras in a range that includes the entry-level F-401 and F-601, and the professional F4. The F-801s, which was in production from 1991 to 1999, was later replaced by the F80. These include a fully programmed automatic exposure system, shutter speed range from 30-second to 1/8000-second, with B, 1/250-second flash synchronization, evaluative 2D Matrix, and 75% Center-Weighted Average metering modes. Unique to the camera is the Multiple Exposure capabilities which allow up to nine shots on a single frame, and a 'two shot' self-timer which allows a second shot to be taken by the self-timer a couple of seconds after the first. Film speed is DX-coded, with manual override, from ISO 6 to 6400. The F801S is compatible with the Nikon Multi-Control Back MF-21, which allows for freeze-focus, data imprinting, and automatic exposure bracketing. Similar to the professional Nikon F4, the F-801 and F-801s will accept most Nikon AI and AF F-mount lenses. All features are available when used with AF-type lenses while Manual and Aperture-Priority exposure programs using center-weighted metering are available for non-CPU (AI and AI-S) lenses. Autofocus is not supported with AF-I (autofocus with internal motor) and AF-S (built-in autofocus with silent wave motor) lenses, and Vibration Reduction (VR) is not available at all. G-type lenses are usable in Program and Shutter-Priority modes, and in Manual or Aperture-Priority modes only at minimum aperture. Exposure mode setting for the F-801s includes P Dual (Program Dual) where the camera automatically selects either normal or High-Speed programme depending on the focal length of the lens used, P High (Program High), the high-speed program option, P (Program), Shutter-Priority, Aperture-Priority, and Full Manual. The F-801s provides for three metering modes - Matrix, Center-Weighted, and Spot Metering, all of which can be used in both auto and manual modes. The autofocus system on the F-801s is a single point horizontal linear sensor and is sensitive down to EV -1. With that, the camera's low-light performance may actually exceed many other cameras, as long as its sensitivity to vertical (lines) contrast is maintained. 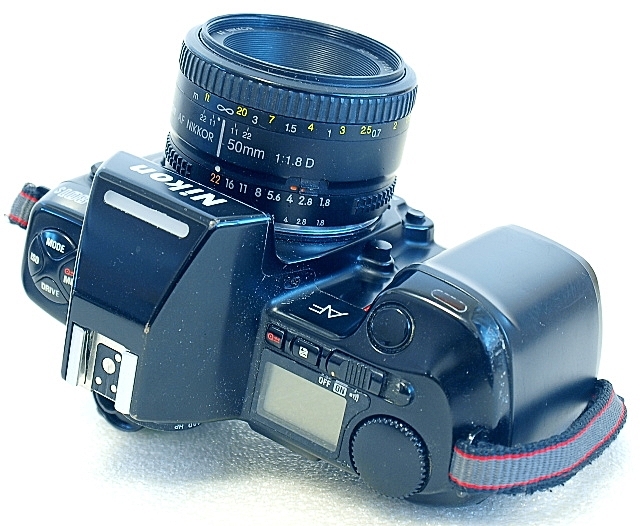 Older Nikon manual focus lenses can be used on the F-801s just as easy. Focusing can be done with the aid of the Electronic Rangefinder or by utilizing the clear matt field of the viewfinder screen. Looking at the myriad of buttons, switches, and slides may look rather complex, but the basis of the F-801s's operations are fairly straightforward. Shutter and program shifts (in M, S and P modes) are controlled by the MODE button and a left or right turn of the Command Input Controller, or in a simpler terminology, the control dial. The same button and dial method are also used for film ISO setting and DRIVE modes. Press the ME (Multiple Exposure) button and turn the dial to select up to 9 exposures for the frame, press both RED icon buttons to rewind the film at the end of the roll, the Self-Time and Metering System Selection button are self-explanatory, which now leaves only the Exposure Compensation an AE-Lock button to look at. All basic controls except auto-bracketing and flash exposure compensation are on the camera. 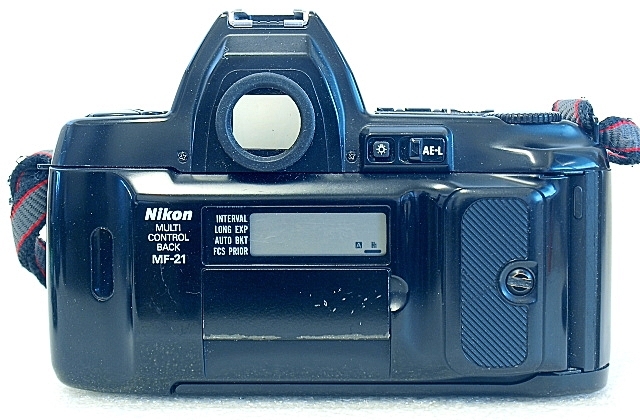 The former requires the MF-21 back, the latter is set on the flash (If the flash doesn't support it, use manual ISO changes instead). Slow sync is automatic. Shutter steps are 1EV, but Exposure Compensation is +/-5EV in 1/3EV steps. All pertinent operation modes of the F-801s are displayed on the LCD unit. This includes the following indications: Metering System, Exposure Mode, Film Speed Setting, DX-Coded Film Speed Setting, Film Advance Mode, Film Installation, Self-Timer, Exposure Compensation, Shutter/FIlm Speeds, Electronic Analog Display, Aperture/Exposure Compensation Value, Frame Counter/Self-Timer Duration, Number of Multiple Exposure, Multiple Exposure, Film Advance and Rewind. The viewfinder of the F-801s, with a coverage of 92% of the image field, is fitted with a backlighted info readout LCD panel at the bottom of the screen. Display indicators include the following information: Focus Indicators, Exposure Mode, Shutter/Film Speeds, Aperture/Exposure Compensation Value, Exposure Compensation Indicator, Flash Ready LED. The clear matt-field screen is etched with a 12mm diameter reference circle, focus brackets, and a smaller 3.5mm diameter reference circle. The F-801s requires 4xAA batteries to power the camera. Comparatively heavy at 695 grams without batteries, but with a solidly built bakelite body over metal frame construction, the F801s has the form factor that is very apt and comfortable for two-handed operation. Against a weak point of many mid-level AF SLR cameras, both the F-801 (N8008) and the F-801s (N8008s) have enjoyed the enviable reputation for being extremely reliable in performance and durability. One factor that remains clear, however, is the fact that the F801s cannot drive AF-I (autofocus with internal motor) and AF-S (built-in autofocus with silent wave motor) lenses. To overcome this, you might choose to go to other models instead. While the AF system of the F-801s may be a bit slow, by today's standard, there is a lot more going for the camera in its form and functionality as a good starter camera for the beginner film enthusiast. And for all the reasons that the F-801s remains grossly underrated if any, an opportunity exists for you to get one at a cost that you may never expect. Copyright © 2017 - 2019, ImagingPixel. All rights reserved. Theme images by gaffera. Powered by Blogger.